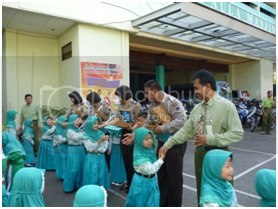 One of the programs in the ICP is Parenting Teacher. Parenting teacher learning is a day program with the parents as teachers. Parents teach students specific topics, according to their profession. 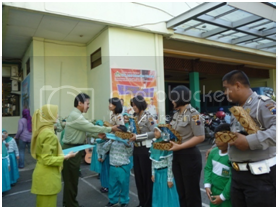 The purpose of this activity is to improve cooperation between teachers and parents. They also provide education to children directly through the expert that their parents according to their expertise. Not long ago, ICP invites parents who work as police officers. They are mothers who work as police woman. On that occasion will be invited are Mrs. Yuli, Mrs. Widi, and Mrs. Ida. They are Tika's maother, Rio's mother and Naila's mother. Later that day they play as teachers Isriati. But they remained in police uniforms. Theme of learning undertaken, is discipline. In this learning process, in containers in sports, marching, singing, simulation, and frequently asked questions. While the place of learning in the school grounds. In the learning process, the parents, teach marching order, order traffic, traffic ethics and obedient attitude toward regulation. 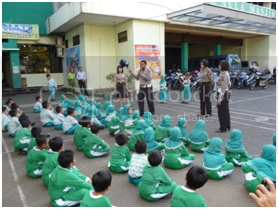 Character education is expected, the students are being disciplined, orderly, tolerance, and obey the rules. 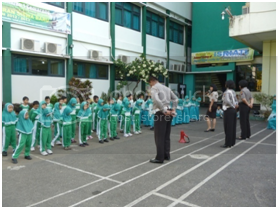 In addition, the students are brave and resilient physical, spiritual and bodily health. By learning "Parenting Teacher", the students are very excited. And this kind of learning, it is very effective in instilling a positive attitude to the students. Because in addition to different learning atmosphere, teachers also come from the experts. After the learning process, the "parent teacher" was also given an award by their sons. Their own children who presented the award. It is an education to inculcate "respect" parents, and experts. Although the award of a plaque, but the plaque is, as a symbol of cooperation between teachers and parents in educating children. In another occasion, ICP invites parents, who is a doctor. At that time ICP invite Mrs. dr. Rini, Luhur's mother. She was a doctor, who works in the military hospital. As a medical profession, of course, she was an expert in health. Therefore, she invited her capacity as a health professional. 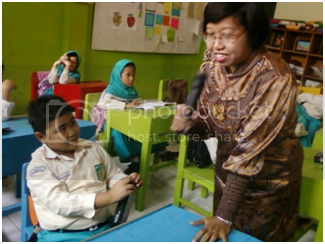 On the occasion, Luhur's Mother as a health teacher in the classroom of ICP. 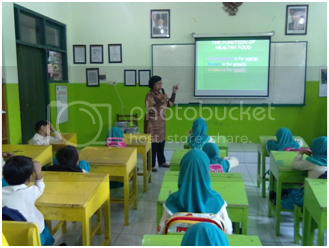 Learning themes presented by Mrs. dr. Rini, is about healthy food. "Teachers doctor" on this one, a very well about healthy foods. Therefore, she was asked to teach about healthy food, which should be consumed by the students. 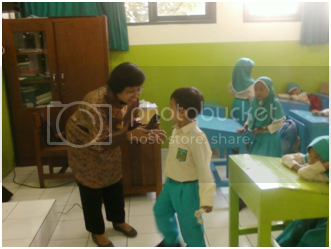 The learning process is carried out by Luhur's mother, very interesting. The students were very excited and enthusiastic. In addition to a different teacher, the teacher was truly an expert in his field. At the end of the lesson, the students recognize the types of healthy foods, such as rice, fish, meat, vegetables, fruits, and milk. Food is to be healthy to eat, if cooked properly. For example, do not use preservatives, dyes, synthetic food flavoring. In addition, the students also know the kinds of unhealthy foods, such as fast food, foods that contain dyes, synthetic flavoring, or contain dangerous substances. In the learning process, the values we want to impart to the students, is the habit of healthy living, healthy eating, and can maintain the health of themselves and their environment.